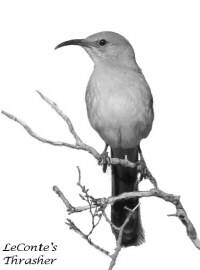 Want to see a LeConte's Thrasher? Watch wintering Ferruginous Hawks feeding on gophers? PREVIEW a chapter by clicking here! The PDF version of the book costs $11.00. Pay $11 via check or PayPal and send me an e-mail at henrydetwiler@earthlink.net, so I'll know where to e-mail you the electronic copy of the bird guide. Thanks! This informative book provides detailed accounts of the best birding sites at the Salton Sea and in Imperial County. Each chapter contains the following information: habitat, target birds, site description, birding suggestions, and driving directions. The book ends with a comprehensive, seasonal checklist. The price is $21.00 (which includes postage). Click here to preview the Table of Contents, the Introduction, a sample chapter and for ordering instructions.